Kung fu groups are keeping busy through the 15 days celebrating the Lunar New Year. 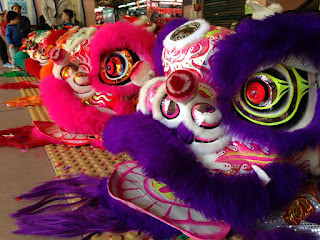 Their members perform lion dances for whoever wants their store, office building, shopping mall, apartment blocks to be blessed. While the lions will be coming to my apartment building tomorrow afternoon, they were out in force in the nearby wet market today. I went to do my grocery shopping and heard the clash of the cymbals and drums. 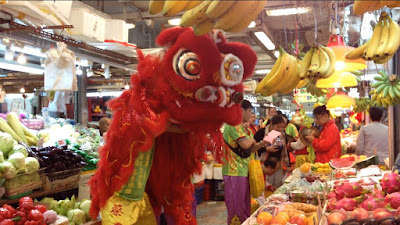 On the second floor where fruits and vegetables are sold, a red lion was going stall by stall, performing the same ritual. It bows in front of the stall, then it opens its mouth and swallows the head of Chinese lettuce that's hanging from a hook with a lai see packet or blatantly, a HK$100 bill. Meanwhile inside the guy is pocketing the money and then rips up the lettuce because after a short moment, the lion's eyes flutter, its ears move, and the it opens its mouth again and spits out bits of lettuce. Sang choi or raw lettuce sounds similar to "create wealth", and the wet market stall owners are hoping for a good Year of the Rooster. And the way the economy is going, we're all hoping for financially better year, but we've been warned it's going to be a tough road ahead.